Over 4,000 square feet of flexible function space is perfect for meetings or celebrations along the shore. 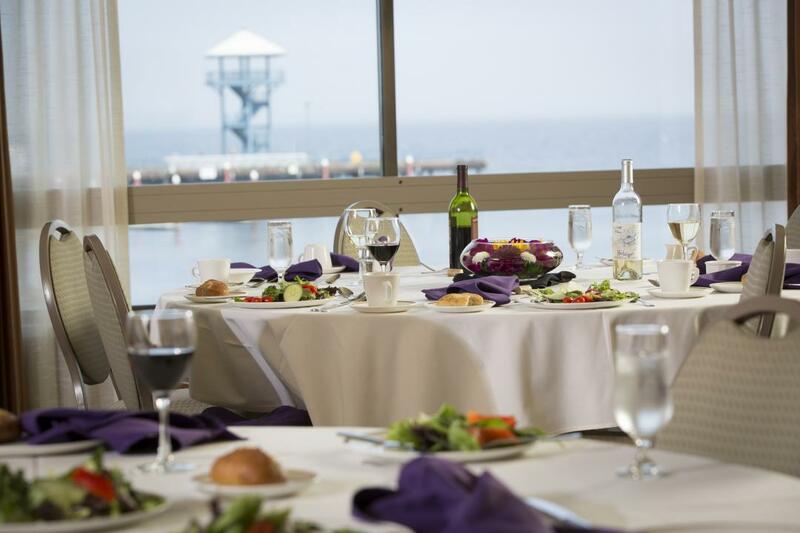 Guests can enjoy the same beautiful water views while enjoying fantastic, fresh seafood at our hotel in Port Angeles' onsite restaurant, the Port Angeles CrabHouse and Lounge. Don't forget the most important meal of the day- we also serve Red Lion's Signature breakfast each morning. Port Angeles is a beautiful seashore town surrounded by natural wonders. Whether you're touring Olympic National Park, sampling the local seafood, or simply looking to get away, the friendly staff at Red Lion Hotel Port Angeles is happy to welcome you to our exciting city. Our Port Angeles hotel has amenities to match our stunning location atop the Strait of Juan de Fuca shoreline. The experience starts from the moment you arrive at our Port Angeles, WA lodging. Enjoy complimentary self- parking or a free shuttle from the Port Angeles airport, then log on to the complimentary Wi-Fi and surf the web while you take in the waves. We are happy to welcome pets to our hotel. Our conveniently located, pet-friendly hotel in Port Angeles is near walking trails along City Pier Park and the beach. We have rooms specifically designated for you and your furry family member with close access to the outdoors. A small pet fee will apply. To learn more about our pet policy, pet-friendly rooms and room availability please call us at (360) 452-9215. Angeles Clinic for Animals - Veterinarian. TLC Pet Pros - Grooming, Boarding, Daycare. If you prefer to stay in, we offer the same delicious meals and outstanding service in the privacy of your room. Guests often ask us where they can find the best Port Angeles seafood, and we’re happy to say that it is right on site. Settle in at our waterfront Port Angeles restaurant to enjoy a delicious meal with family and friends. The rolling water views perfectly complement the restaurant’s fresh Port Angeles dining. Each ingredient is chosen for freshness, and much of our food is sourced from local fishermen and farmers to provide you with the most delightful bite. Our restaurant in Port Angeles’ signature dishes includes alder planked salmon, CrabHouse Dungeness crab cakes, and homemade bread pudding drizzled with Jack Daniels sauce. We also offer a “Just for Today” menu, offering guests a taste of what’s fresh in the northwest on that very day. Cheer on your team at Port Angeles’ premier waterfront sports bar. A 52” plasma screen and 3 TVs at the bar mean that you won’t miss a minute of the action. You can also soak in the calm water views featured in the lounge’s floor-to-ceiling windows. If you’re looking for a quick bite and a beer, don’t miss our Happy Hour appetizer and drink specials offered daily. At Red Lion Hotel Port Angeles, we recognize the hard work that our local, state, and federal government employees provide, which is why we’re excited to offer the per diem government traveler rate at our Port Angeles Hotel. Fueled by government activity, Red Lion Hotel Port Angeles is an ideal Port Angeles location to rest and recharge. For the best government discounts on Port Angeles hotels, look no further. Terms: Guest must have valid government ID at check in to our Port Angeles Hotel. Active duty/retired military personnel, federal, state & local government, cost contractors, staff of public schools, colleges and universities and employees of foreign governments are eligible for the per diem rates. When you stay with Red Lion Port Angeles, you'll not only have convenient access to exciting activities in Port Angeles, but the surrounding area as well. With a terminal in Port Angeles, Black Ball Ferry Line is prepared to carry you from Washington State to Victoria, British Columbia via its flagship M.V. Coho. The only daily, year-round passenger and vehicle ferry service between downtown Victoria and Port Angeles, the M.V. Coho has transported more than 22 million passengers and six million vehicles over the past fifty-plus years. Originally carrying freight trucks, in addition to passengers between Seattle, Port Angeles, Port Townsend and Victoria, the M.V. Coho has focused specifically on the Port Angeles to Victoria passenger and vehicle route since 1973 and has developed an unparalleled record of reliability over the decades. The M.V. Coho was named after the silver salmon found in waters of British Columbia and Washington State crosses the Strait of Juan de Fuca between Victoria's Inner Harbour and Port Angeles. In addition to a gift shop and cafeteria serving a variety of hot and cold food and beverage items, the ferry boasts close-up views of the Olympic Peninsula and natural wildlife via floor-to-ceiling windows, outside decks and a covered solarium. Be sure to check out the M.V. Coho's current schedule and view upcoming events to better plan your trip. Learn about the local marine life at this laboratory and public aquarium on the new City Pier. The Feiro Marine Life Center exists in large part thanks to local teacher and biologist Art Feiro. The center is a multifaceted, dynamic, living, breathing facility, providing a public display of marine organisms, a teaching laboratory, a public center for marine studies, and a point of interest for tourists. Our Port Angeles hotel is only a few steps from the Feiro Marine Life Center. Explore this and other local attractions during your stay with us. The Olympic Game Farm lets you get face to face and experience wildlife at close range, offering visitors the opportunity to see a rare white Siberian tiger, witness a Kodiak bear's huge size, or get slobbered by a buffalo. Driving tours are the main attraction at the Farm. The tour takes you through 84 acres of terrain, giving visitors a unique "face to face" interaction from your vehicle. The farm now offers camel and pony rides along with a gift shop to pick up a souvenir. Explore The Olympic Game Farm during your next stay at our Port Angeles hotel. Guests of Red Lion Port Angeles looking to explore the expansive beauty of the Pacific Northwest will find ample opportunity in nearby Olympic National Park. The internationally recognized park encompasses nearly one million acres of distinct ecosystems and reflects a rich tapestry of natural history. Forest, coastal, and mountain ecosystems make up the vast natural delight of Olympic National Park. The park is designated as both a World Heritage Site and an International Biosphere Reserve by the United Nations, serving as a living laboratory for professional and student studies as well as an expansive, natural playground for visitors. Opportunities for adventure, recreation and exploration abound amidst the natural beauty of each diverse ecosystem. Throughout the park's glacier-capped peaks, wild Pacific coast and old-growth forest is an array of cultural and historic sites, providing visitors the opportunity to learn about the varied cultures of the people who have called Olympic home for more than 12,000 years. Plan your trip to our Olympic National Park hotel with the help of suggested itineraries and check out the park's calendar before visiting for the latest information and schedule of programs. Imagine hiking amid snowcapped peaks and breathtaking rainforests. You can experience amazing alpine, coastal wilderness and the best Port Angeles sightseeing when you visit Olympic National Park. 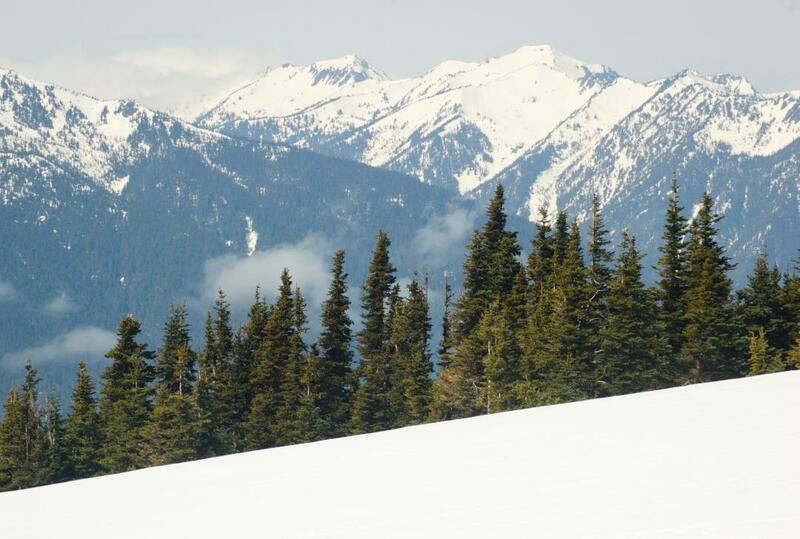 From kayaking to scuba diving, mountain climbing to skiing, the Olympic National Park activities are endless. Only a five minute drive away, Olympic National Park shows that there's plenty of things to do in Port Angeles. Hike on Hurricane Ridge to experience the untamed beauty of the Olympic Mountains, the Strait of Juan de Fuca, and lush alpine meadows. The trails range from easy to difficult, so everyone can join the hike. Explore Lake Crescent’s 12 miles of crystal clear water. Hike through moss covered trees and large ferns to enjoy the breathtaking Marymere Falls. Travel the Pyramid Trail to enjoy amazing views of Lake Crescent, Mt. Storm King and the blue-green slopes of Aurora Ridge. These water views are sure to make you long for a dip in the cool, clear waters. Lake Crescent offers plenty of opportunities for swimming, boating and fishing. Walking westward through Olympic National Park puts visitors in the direct path of some incredible natural wonders. Go fly fishing in the Sol Duc River or take a dip in one of three mineral pools at Sol Duc Hot Springs. A hike near the hot springs will allow you to peer through the mist at the majestic Sol Duc Falls. A wealth of exciting activities and outdoor adventures await you on Vancouver Island, just moments from Red Lion Hotel Port Angeles. Wander amid the natural beauty of the Butchart Gardens or explore Victoria monuments and galleries. From whale watching to seaplane tours and beyond, there are endless things to do in Victoria, BC. Meander through paths surrounded by acres of beautiful flowers and plant life at Victoria's premier attraction, showcasing an array of different garden types. Discover unique artifacts and relics rich with cultural history at one of Canada's best museums, featuring scale and full-sized recreations as well as touring exhibits. Witness the majesty and grace of one of the sea's most revered creatures, with Vancouver Island whale watching tours that take you along the island coast for an unspoiled glimpse of these beautiful animals. Take a leisurely stroll through this peaceful park, featuring the Beacon Hill Park Petting Zoo and enjoy a panoramic view of the Vancouver Island coastline and Olympic Mountains. Go back in time at this spectacular Victorian era castle in all its fully restored glory, decorated with period artifacts, brilliant works of art, and intricate stained glass. Explore esteemed works of art at this captivating museum, including Canadian icon Emily Carr's work on permanent display. Unwind and enjoy the sights and activities in Victoria from a unique vantage point as you ride along a horse-drawn carriage through Beacon Hill park and the city's most popular tourist areas. There are endless outdoor activities within easy reach from our Port Angeles hotel. One of the most spectacular choices is the Port Angeles whale watching excursion. Committed to responsible wildlife viewing, various tour companies near our hotel make it easy to go whale watching in Washington. You can observe these gentle giants of the sea and learn all about their fascinating habits and role in our ecosystem. The best time to see whales in the Pacific Northwest is between March and November. The Island Adventures Tour guarantees whale sightings on every one of their excursions, which means great value for your money. Minke, transient orca, resident orca, humpback, and gray whales are all known to frequent the waters surrounding Port Angeles. See whales and other incredible wildlife on a whale watching tour.